The first US trailer for Ivan Kavanagh’s ‘Never Grow Old’ has been unveiled by Saban Films and Lionsgate ahead of the film’s North American release on March 15th. 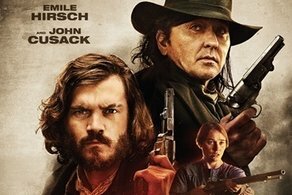 Shot in Ireland and Luxembourg, the cast of the Irish western is led by John Cusack (‘Gross Point Blank’, ‘High Fidelity’) and Emile Hirsch (‘Into The Wild’, ‘Milk’), while Antonia Campbell-Hughes (‘The Other Side of Sleep’), Déborah Francois (‘Populaire’), Danny Webb (‘Valkyrie’) and Blake Berris (‘She’s Missing’) round out the cast. Set in the harsh American frontier landscape of 1849 the film is about greed and its consequences. It is a Faustian tale of outsider Patrick Tate who lives with his young family on the outskirts of a relatively peaceful frontier town until outlaws take over and kill all those who challenge them. Patrick plays a dangerous game befriending and profiting from the outlaw's mayhem and it is only a matter of time before he must protect his own from the bloodshed. ‘Never Grow Old’ is written and directed by Ivan Kavanagh (Tin Can Man’, ‘The Canal’) with Piers McGrail as DoP, Production Design by John Leslie, Costume Design by Jackye Fauconnier and the Editor is Bernard Beets. The film is produced by Jacqueline Kerrin and Dominic Wright for Ripple World Pictures alongside Jean-Michel Rey of Rezo Prods and Nicolas Steil of The Iris Group. The film received development funding from Screen Ireland, Creative Europe MEDIA, Quickfire Films, and the Luxembourg Film Fund. Saban Films are handling the North American release on March 15th with Metro International Entertainment Ltd handling the international sales of the film. An Irish release date is expected to be announced later this year.